As you know, I’m all about hiking with dogs. I believe that almost any dog in good health can do it. However, it IS true that not all dogs can go the same distance or over the same terrain. If your dog has never been hiking before, you should start them slow on easier trailsand work your way up to more difficult hikes. Even dogs that love hiking and have been hiking for years have their limits though. Many years ago I made the mistake of pushing Chester too far. I didn’t notice that he was getting tired and overheating. I’ll admit that I knew way less about hiking with dogs back then. Also, I was too busy being proud that my 12 lb dog was hiking almost 15 miles in one day! I would like to say that was the last time ever that I let Chester or Gretel push themselves too far. Unfortunately, it wasn’t. While the later incidents were never as bad as that first one, there were a few situations where I could have been a better pet parent. Over the years, I’ve learned my lesson. Now I am hyper-vigilant about making sure I’m meeting their needs. Does that mean that I never make mistakes with Chester and Gretel while hiking? No. The point though is that I learn from them and do better next time. Sometimes it takes making mistakes to learn where your dog’s limits are. For example, they may seem totally fine on the trail but you notice they walk really stiff the next morning. Or maybe, like happened with Gretel once, she was nuts on the trail but then showed the beginning signs of heat stroke while on the way home. It’s through reading as much as I can about trail illnesses and injuries, and hiking with my dogs for 10 years, that I’ve learned to know when they’re doing too much. A rapid heart rate (if it stays high after resting) and reddened gums can be an indicator of heat stroke. A cold dog who is breathing slow and shallow, and seems to be in a stupor-like state, may have hypothermia. If your dog starts to limp they may have a crack or tear in their paw pad or may have pulled a muscle or tendon. If you notice that your dog is licking a specific area during breaks, they may have an abrasion there. This could be caused by chafing from their collar, harness, jacket or they may have scraped the area on a rock or tree. 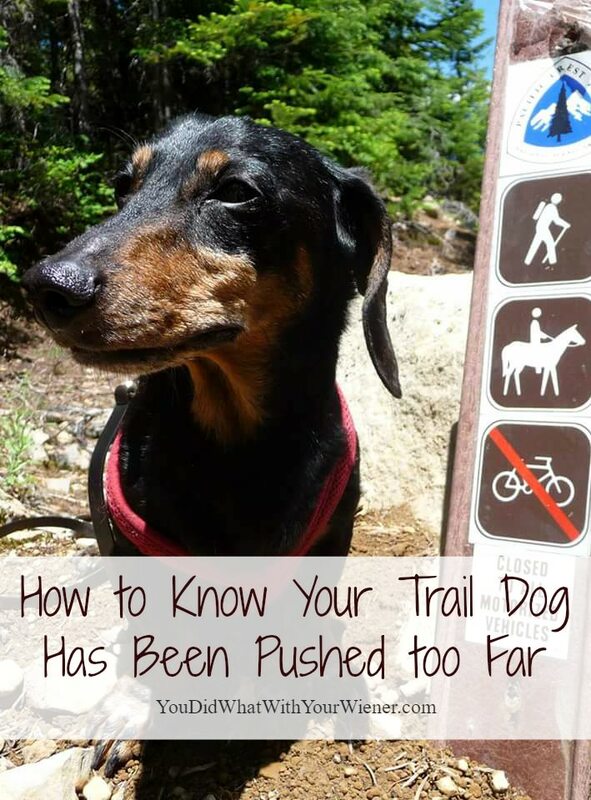 For 5 more (important) signs, read the article I wrote – How to Know Your Trail Dog Has Been Pushed too Far – for the Sierra Trading Post Blog. The signs that a dog is being pushed too far are sometimes subtle. Almost never will a dog act like they’ve had enough. Dogs have the tendency to go-go-go until they physically can’t anymore. It’s up to us, their people, to make sure they don’t overdo it. Knowing how to identify your dog’s warning signs will help keep them safe and happy on the trails for years to come. Has your dog every been pushed too far? How did you know? Montecristo at 3.5 pounds always stuns me. We recently did 36km in 3 days in the deep woods. We walk in a row with Stefan in the lead, Monte man in the middle and me bringing up the rear. So I watch him… See him. If he slows down I monitor to make sure it’s not fatigue or an injury. Most times he’s just thirsty! Only 2-3 times have we picked him up and put him in a sling bag. These little ones can go!! That’s great. I actually think being smaller is an advantage because there is less weight to drag up a hill. Having a lower center of gravity helps for sure anyway. I think Monte would even beat Gretel right now at distance 🙂 We’re doing almost that distance in a couple of weeks. I’m going backpacking with my brother and we’re bringing Gretel. It will be 3 – 5 mile hikes in a row. I am pretty sure she can do it but am still pretty nervous because of her back. I was wondering what sling bag you use? We recently just adopted a little 12 pound maltypoo plus a mix of something else and want to get her slowly adjusted to hiking and figured we can combo with a sling bag. Some dogs can self limit correctly but, in my experience, they always push past the point they should have been stopped at. I am super glad to hear you learned to recognize the signs in Bailey. Faolan will go and go, and go and go. I have to drag him inside at times. My girl sets her own pace, enjoys taking breaks, and lets me know when she is done. I suffered through a heat stroke with an ex boyfriend’s dog, many years ago. Lasix, decadron, mannitol, IV fluids, and a $900 vet bill later, I vowed I would never allow it to happen to another dog in my care later. My dog, Oscar, who is now 15 is smart enough to just sit down when he is tired to let me know he has had enough! We live in extreme heat (New Orleans) so I am walking him at 6 a.m. or earlier to escape the heat. He has lost 8 pounds over the last year and is doing SO SO much better. It is definitely worth it to get out of denial about your dog’s weight if it is excessive. He eats his regular dog food and if he wants snacks he gets carrots, cabbage, pumpkin or other vegetables. Before he lost weight he was paralyzed for 2 weeks and could not go to the bathroom – #1 or #2. Luckily I got the BEST advice ever which was to get the weight off of him. I am grateful to the wise person who woke me up as I was in denial–they are awfully cute when they beg–especially if they go into “tripod” position! That’s great that Oscar has lost so much weight! We were “lucky” with Gretel’s IVDD back injury because she was already at a healthy weight. The vets told me that it’s the biggest challenge with Dachshunds and IVDD – they are often overweight, which puts strain on their back, but how do you get a dog restricted to 6 weeks crate rest to slim down? Keeping a dog at a healthy weight is one of the most important things owners can do for their dog’s health. On how I know the commitment it takes to ignore those pleading eyes though! My cat won’t hesitate to just walk away when he’s had enough play, but my dog would go on and on with our walks if I let him! Great post- it’ll definitely help me look for those warning signs, especially in the heat. What do you do when your pup has had enough before the hike is over? Do you carry them in your arms or do you have something they can ride in? Ive very rarely had to carry Chester or Gretel. They never seem to tire out before I do. However, I did need to carry Chester out in an emergency once. This was the pack I used (and still cary on every trip as a way to emergency evacuate) http://youdidwhatwithyourweiner.com/rei-flash-18-pack-review-you-put-your-weiner-in-there/. As for carrying a dog regularly, I’ve tried a lot of packs. I have Dachshunds and havn’t found a great solution that is safe for their backs. This is what we’ve used a few times though: http://youdidwhatwithyourweiner.com/backpacks-carrying-dachshund-dog/. My friend uses the Outward Hound front pack for her Chihuahua. I hope that helps. I just took my rottie, Zoe in a 7 mile hike… the next day she was walking very stiff and today (2nd day) she just stands up to eat and then she goes back to laying down. I think I’m gonna take her to the vet tomorrow…. all I see is that in one of her paws she has a tear but overall I think I exhausted her. 😞 Thank you for this article! Hi Luisa. Yes, it does sound like that was too much for her. The first couple times I accidentally pushed Chester too far, I felt like I “broke him”. He barely moved for two days. All he id was sleep and eat. He was totally fine after a big rest but it helped me to learn his limits so I didn’t push him as hard next time. It never hurts to get a vets opinion though if you are not sure that’s the only reason Zoe is acting lethargic. Hi Anna. In my experience, no that is not normal. It can indicate an injury like an ACL tear or something. I would definitely take my dog to the vet if they were still “recovering” two weeks later. Gretel has been on a 15-mile hike before, and my previous Dachshund used to run 5 miles with me, and the most time they needed to recover was 2 days… and they just slept a lot. They had to problem getting up and moving around besides walking slightly stiff. I hope it’s nothing bad.